Hairstylist Maxi North is living her dream in Manhattan, poised to become junior partner in one of the city’s classiest salons. Her father’s death puts her plans on hold while she travels home to face her past. There, she is forced to confront unrequited feelings for her former best friend, Jason Hanley, as well as her deeply buried guilt over her younger brother’s death. Fireman-in-training, Jason Hanley knows how badly Rainbow Falls needs its own fire station. As a new Christian, he pledges to serve the people of his community and to open a fire station as soon as possible. When his friend, Maxi North, and her mother almost perish in a fire, Jason becomes involved in helping them re-build their farmhouse. Soon he finds himself wondering if he and Maxi can ever put aside their differences to find a future together. “Ninth floor penthouse.” The musical voice oozed from the speakers as the elevator slid to a smooth stop. The doors whispered open, and Maxi North stepped out into the magnificent lobby of Baronne’s Salon. She paused, latte in hand, and smiled at the sheer luxury on display. The ornate crystal chandelier glittered above the mahogany reception desk that housed a striking array of orchids. Sometimes Maxi had to pinch herself to make sure she wasn’t dreaming—that this former farm girl from Rainbow Falls, North Dakota, now worked as a junior stylist in one of the top salons in New York City. She hiked her purse farther onto the shoulder of her satin jacket as she strode into the heart and soul of the salon—the chrome and glass stylist stations, where the employees worked their magic for a pampered clientele. The familiar scents of floral shampoos, coconut conditioner, and hair spray swirled around her. Coming in for the afternoon shift meant that most of the stations already bustled with activity. On the way to her own station, second chair from the back, she waved to her friend Cherise. With a contented sigh, Maxi set down her latte, threw her purse in the bottom drawer, and plugged in her curling irons. “You’re early today.” Cherise stood on tiptoes, stretching to reach one of the sliding cupboards at Maxi’s right. She grabbed some towels and blew her pink-tinted corkscrews off her forehead before flashing a dazzling smile. The numerous cups of coffee Maxi had already consumed churned in her stomach. “Good news or bad, do you think?” She hadn’t dared heed the latest gossip that the Baronnes might be considering taking on another partner. Lillian Rothman’s formidable figure crossed the room, a frown already creasing her forehead under the silver-gray swoop of hair, leaving Maxi no time to dwell on what may or may not be happening in that meeting. After washing and setting Mrs. Rothman’s hair in large rollers, something the eccentric woman insisted on instead of curling irons, Maxi positioned her under one of the dryers and provided her with an espresso and some biscotti before ushering the next client to her chair. Once Maxi finished the quick trim, she finally found a spare minute for a sip of her now-cold latte. She grimaced and swallowed, her eye catching a movement in the mirror. The two other senior partners spilled out of Philippe’s office. Philippe’s wife, Suzanne, laughed before flitting off in the direction of the spa, high heels tapping across the marble floor. The timer dinged, signaling Maxi to check Mrs. Rothman. She escorted the woman back to her station, and as Maxi started to remove the rollers, heavy footsteps sounded behind her. “Miss North, my office, ten minutes.” Philippe barked the order and disappeared down the back corridor. Maxi froze, hand poised over her client’s head. Why would her boss want to see her now? Could it have anything to do with the morning pow-wow? She bit her lip at the giddy thought. Then she quickly dismissed the idea. They’d never consider someone so young for the position of partner. In all likelihood, Philippe wanted to review her list of clientele. Or discuss the new ad campaign. Still, as Maxi continued styling Lillian Rothman’s hair, she couldn’t help but fantasize about the possibility. “Quit daydreaming, girl. I haven’t got all day.” Mrs. Rothman’s raspy voice brought Maxi crashing back to reality. Ten minutes later, with Mrs. Rothman primped, sprayed, and satisfied, and a sizeable tip tucked in Maxi’s pocket, Maxi crossed the busy salon, neatly avoiding Cherise with a tray of color. Outside Philippe’s office, she smoothed down her green jacket and knocked on the door. “Entrez.” Philippe’s lilting French accent made Maxi’s lips twitch. She opened the door and stepped inside, inhaling the scent of opulence. Each time she’d had the occasion to come into this office, the magnificence of the space took her breath away. A huge picture window overlooked the spring greenery of Manhattan’s Central Park. To the right, Philippe’s oversized chrome and glass desk sat on a rakish angle. An impressive space for an impressive man. She still couldn’t believe her luck in landing a job here. Maxi shifted her gaze and frowned at the sight of Sierra Scott, one of the other junior stylists, already seated in a guest chair. As usual, Sierra had her honey hair pulled back in a perfect coif, complementing her champagne blouse and black skirt. Maxi resisted the urge to fiddle with her own hair or adjust her clothing. In comparison to Sierra’s sleek style, Maxi always felt garish and overdone. Today, with the help of some styling gel, Maxi’s red hair spiked out in all directions. The total opposite of Sierra’s chic elegance. “Have a seat.” Philippe waved to a second guest chair. For a man in his early fifties, Philippe’s vitality gave him the air of a much younger man. Faint threads of silver at the temples, as well as a few lines around his eyes, were the only concession to his age. His steely gaze could still wither anyone with one glance. Now his guarded expression gave nothing away as he watched Maxi sit down. “There’s been talk.” Sierra crossed her long legs, accentuated by her skimpy mini-skirt. A surge of adrenaline spurted through Maxi’s system. She didn’t dare breathe in case she missed her mentor’s next words. Maxi forced her brain to slow down and take in every word Philippe said. As she left the office, Maxi pushed back her annoyance at the other woman’s blatant flirtation with their married boss and focused instead on the amazing opportunity just handed to her—the very real possibility that her lifelong dream could now be within her grasp. Excitement buzzed though her veins while her mind reeled. The diversity of her skills gave her a distinct advantage. She could do almost any job in the spa. Pedicure, manicure, any style of hair—even colors, weaves, and extensions. And she was learning more every day. She breathed a sigh of thanks to Peg Hanley for taking her under her experienced wing while Maxi was still in high school. Who would have imagined that working at the Cut ’N Curl in Rainbow Falls would lead to a position in the top salon in Manhattan? Memories of Peg brought about a sudden, sharp pang of homesickness. Maxi absorbed the wave. Then with great effort, she shook it off. She could not afford to be distracted from her goal. Instead, she strode over to her station, deposited the envelope in the drawer, and tidied her area in readiness for her next client. Still, Maxi couldn’t seem to shake her lingering thoughts of Peg. She longed to call her and share her incredible news about the partnership. But Maxi couldn’t be sure he wouldn’t answer the phone. Before she could stop herself, Maxi rifled through the contents of her drawer in search of the treasured dog-eared photo within. The familiar shaft of joy and sorrow seared through her at the sight of Jason Hanley’s engaging grin. It seemed a lifetime since she’d seen Jason or heard his voice. Peg had snapped this picture of them at their high school graduation several years ago. He stood with his arm draped around her shoulders. Both their faces were filled with youthful exuberance—one of those perfect moments in time, captured forever. If only they could’ve stayed in that moment. “You know you don’t stand a chance against me.” The hiss of Sierra’s voice behind her startled Maxi out of her daydreams. Sierra snorted. “I’m not intimidated by a farm girl from Hicksville. As far as I’m concerned, the partnership is already mine.” With a dismissive wave of her hand, Sierra sashayed back to her own area. Maxi let her irritation roll over her and slide away. Sierra would not ruin the deliciousness of this moment. Maxi’s days in “Hicksville” were long over, and her future as a partner at Baronne’s shimmered as brightly as the mirrored lights. Nothing or no one would get in her way. She allowed herself one last glance at the tattered photo in her hand before slipping it into the pocket of her purse inside the drawer. With one sharp click, she shut away the past and focused her energy on the future. A little after nine o’clock, Maxi jogged up the stairs to her second floor walkup on West Fifty-Sixth Street, excitement pumping through her system. Fumbling with the key in the door, she pushed her way inside, dropped her takeout Chinese food on the scarred coffee table and kicked off her heels. She already itched to take out her portfolio and see where she could improve it. Ideas buzzed in her head for innovative, new hairstyles. Her cell phone jangled as soon as she opened the takeout container. She jumped to grab it out of the jacket she’d draped over the arm of the lumpy brown couch. Must be Lance. He said he would call her tonight to make a date for the weekend. She smiled, ready to share her good news with the man who was becoming an important part of her life. She stared at the display and blinked, not believing her eyes. 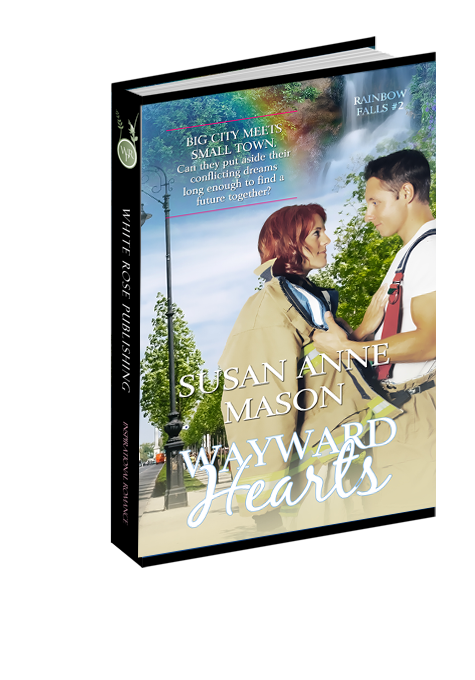 Her heart took off at a gallop in her chest. Why, after two years of silence, would he call now? On the very day she’d dug his picture out of her drawer. Maxi’s hands shook so hard she had to set the phone on the couch beside her. What would she say to him? Unbidden memories of their last encounter crowded her thoughts. The ugly accusations, the words hurled in anger. She wasn’t prepared to deal with all that right now. So, coward that she was, she let the call go to voice mail. Her relief was short-lived when the phone chimed again seconds later. The serious tone had her rising off the sofa to pace the small living area. Something was wrong. She could sense it. Panic clutched her throat. “What is it? Is Mama all right?” Her mother’s multiple sclerosis had been under control, but you never knew when a setback could occur. Maxi eased herself down onto the arm of the sofa, dread pasting her mouth closed.